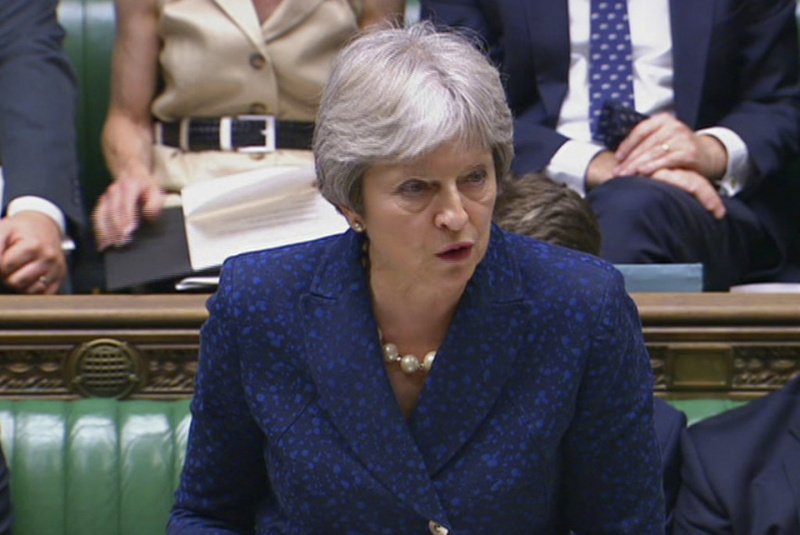 LONDON (AP) — British Prime Minister Theresa May met with her shaken-up Cabinet on Tuesday as she tried to restore government unity after the resignations of two top ministers over Brexit. May has spent the past few days fighting for her political life as first Brexit Secretary David Davis and then Foreign Secretary Boris Johnson quit, saying May's plans for future relations with the European Union did not live up to their idea of Brexit. May, who has tried to keep calm and carry on, said in a tweet that it was a "productive Cabinet meeting" and that she was "looking forward to a busy week." The resignations rocked May in a week that includes a NATO summit starting Wednesday and a U.K. visit by U.S. President Donald Trump from Thursday. The trans-Atlantic relationship has had some awkward moments since Trump's election. He has criticized May over her response to terrorism and approach to Brexit, and infuriated many in Britain when he retweeted a far-right group. Asked Tuesday whether May should be replaced as prime minister, Trump said it was "up to the people, not up to me." "I get along with her very well, I have a very good relationship," he said. He was enthusiastic about Johnson, calling him "a friend of mine." "He's been very, very nice to me, very supportive," Trump said. May replaced Johnson with a loyalist, former Health Secretary Jeremy Hunt, and gave Davis' job to Dominic Raab in a bid to shore up her authority. Conservative lawmaker Michael Fallon, an ally of May, dismissed Johnson's "Brexit dream" rallying cry. "Dreaming is good, probably for all of us, but we have to deal with the real world," he said. Fallon warned Conservative rebels that a challenge to May's leadership is "the last thing we need." Other pro-Brexit Cabinet ministers said they supported May and would not resign. Asked if he was planning to quit, environment Secretary Michael Gove said "absolutely not." Two years after Britain voted 52 percent to 48 percent to leave the European Union, May is trying to find a middle way between two starkly differing views — within her party and the country — of the U.K.'s relationship with Europe. A plan agreed by May's Cabinet last week seeks to keep the U.K. and the EU in a free-trade zone for goods, and commits Britain to maintaining the same rules as the bloc for goods and agricultural products. May says the plan will deliver frictionless trade with Europe and avoid a hard border between the U.K.'s Northern Ireland and EU member Ireland. But many pro-Brexit lawmakers are furious at a plan they say will stop Britain forging an independent economic course. Davis and Johnson initially backed the plan, before deciding they could not support it. EU officials say they will respond to the proposals once they have seen details. The British government is due to publish a detailed version of the plans on Thursday.